I've had a busy week. On Wednesday, I had my "techie" (Scott) come to help me to set up a blog. I have a website and the problem is that it's not possible for viewers to make comments, and I have never been able to figure out how to link my email address either. As well, it takes a lot longer to upload my website every day with changes than it does to post a single day's entry on a blog. It will save me a lot of time (except for all the work of moving my entries over from the website). I'm going to give it a try and see how it goes. More update on the move, hopefully, soon. Then yesterday Kelly joined me in the art studio ... well, we didn't actually make any cards, but that was the original plan. Kelly wanted to make the same cupcake card I made in January ... one for each of her two sons, for Valentine's Day along with baking some Banana muffins (their favorite). Instead, Kelly worked on a confirmation invitation for her nephew. We did manage to get a batch of Banana Chocolate Chip muffins baked and we quickly made some valentine's picks for the muffins before she left - so adorable! Thanks for coming over Kel, it was fun! On to the card for today ... this card is for this week's Ways To Use It Challenge (WT360) - Groundhog Day (make a card with repeat images). Yesterday I received my order from Rubbernecker ... three Kittie Kits. I used the leafy branch from one of the kits for today's card along with my new Memory Box die-cut from Simon Says that I received in the mail today! It's been a great week for getting new toys in the mail!! Hope you like. I used my Big Shot to cut out the window box from Naturals White cardstock. I used my Crumb Cake Stampin' Write marker to draw along the crease lines on the window box to give it more definition. I sponged more Crumb Cake ink around the outside edges of the window box. I inked the leafy branch with the Old Olive stamp pad and stamped a few times on the window box. I inked the leafy branch with the Old Olive Stampin' Write marker and added some more leafy sprigs to the front of the window box (these are slightly darker). On the card front of Whisper White, I used a post-it note to mask where the top edge of the window box will be and below. I placed the die-cut on top of the post-it note to mark the width of the box ... I removed the box. I inked the leafy branch with the Old Olive stamp pad and stamped along the top of the box and then stamped a second time (without re-inking), off to one side and higher than the first leaf stamp. I repeated this across the box (second generation stamping). I used the Stamp-a-ma-jig for placement of the flower sprays, inking the stamp with Stampin' Write markers Old Olive, Daffodil Delight and Real Red (tips of the flowers only). I did this five times, starting in the middle (the highest flower spray) and adding lower flower sprays as I moved to the sides. To finish, I inked the leaf branch with Old Olive Stampin' Write marker and added a few branches of the darker green leaves. I removed the mask. I mounted the window box into place and stamped the sentiment in Old Olive ink. I mounted the card front onto a thin frame of Old Olive and then onto a full card front of Whisper White. The whole card was mounted onto a card base of Old Olive cardstock (for stability). Labels: CAS, friendship, poppy stamps, second generation stamping, Stampin' Up! Was directed here from another website, but these spring flowers in the window boxes are just beautiful. have been debating whether to purchase the die and now you made up my mind. BTW, all your cards are lovely..
Hi from the other coast of Canada....PEI. I recently discovered your blog and your cards are so amazing and such an inspiration. I am 3 years from retirement and spend as much of my free time as possible making cards. I will continue to follow your blog - thanks for sharing your talent. You are such an artist when it comes to designing cards! LOVE these! So absolutely charming! 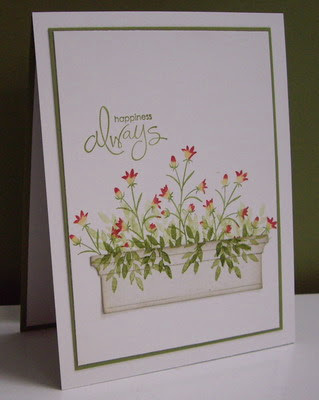 Lovely card is the stamp set from stampin up and the window box die as well? Hello, What is the name of this window box die? Gorgeous cards! Thank you!